This user is an advanced gamer. This user's favorite Mario character is Fawful. This user's other favorite Mario character is Dimentio. This user wishes to feed Toad to a pack of ravenous Chomps. This user's favorite video game is Super Paper Mario. This user loves the Paper Mario series. This user loves the Super Mario series. This user loves the Mario Kart series. This user loves the Super Smash Bros. series. This user despises Paper Mario: Sticker Star and the trend it started of Mario RPGs limited to only main series characters. Hi! Fawfulthegreat64 here. I occasionally edit things on this wiki. I came here because I love the Mario series and wanted to join a community of fellow Mario fans. You can find me on the forum as well. Also check out my YouTube channel, where I currently stream Mario content on Saturdays. I'm a 24 year old autistic gamer with a Mario focus. I also enjoy revisiting things I grew up with, such as SpongeBob SquarePants, The Brave Little Toaster, and more. I'm also a fan of Wreck-it Ralph and its sequel. I am a huge fan of the Mario series, as stated above. 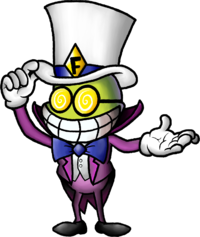 My favorite characters are Fawful and Dimentio. I also like Count Bleck, Antasma and Mr. L, as well as other various RPG characters. In my opinion they are some of the most unique and interesting characters in the franchise but are usually overlooked and not used to their potential. My strongest desire in the Mario franchise is to see rosters of games such as Mario Kart include these RPG characters as I greatly disapprove of restricting them to one (barely referenced/advertised) spinoff series. This goes for all currently-running spinoff series that has underused characters, but my primary focus is on the RPGs as they are my favorites. As far as the main recurring cast goes I love the Mario Bros., Princess Peach, Wario, Waluigi, and Bowser. My favorite game of all time is Super Paper Mario. My Super Smash Bros. Ultimate most wanted DLC newcomers are Fawful, Geno, Paper Mario and Waluigi, but they are all at least spirits so hope is slim. *Asterisk denotes names I've not used on Super Mario Wiki or Mario Boards, but on other sites. A compilation of all representable subjects that have appeared as my theme on Mario Boards as of September 2018. I enjoy making levels in Super Mario Maker. They range in pretty much all the difficulties and include all sorts of themes (such as Super Paper Mario level remakes, insane P switch jumping levels, traditional levels, and nasty troll levels). You can find my Super Mario Maker profiles listed below if you're interested in trying my levels. This page was last edited on April 12, 2019, at 07:09.